year but was also rejected. most effectively carry out those positions. should intervene in the case for the City of Tampa. and not a secular symbol. Buchman; Caroline Kass, daughter of Mr. and Mrs.
Mrs. Ronald Reed; Helene Schwartz, daughter of Mr.
of Mr. and Mrs. Melvin Zack; and Aryan Z am ore.
on your push for "excellence." It's paying off! how the State Tournament goes! Evan and Connie Duglin. Keep those lobs coming! Tampa, and Sandy Bennett and Arthur Bennett of Miami. November 27. He weighed 7 lbs. and was 20 inches long. Berger, and Cantor Hauben officiated. Mazel tov! worked in electrical supplies sales as well until recently. long. He has grandparents in Birmingham, Mr. and Mrs.
the Greeks was not important. A small group of "radicals"
the Jews by the Greek culture. was just a rebellion of zealots. tiochus sent in a huge army. been ransacked by the Greeks. will melee you the star. Tampa International Airport, Tampa. Florid. suit with a long beard!" through the KOL AMI KOSHER KITCHEN. Simcha a truly memorable affair. in sparkling diamonds and gold. Shop Mon.-Fri. 10-6. Sat. 1(5-5.
of Hillel on "rehearsal days." students and 100 parents too! Ellen Stenzler, Nili Peled, Alison Oberne, Judah Gluckma. her life; despite her obstacles. what each person has to offer. provided by a disc jockey. SI HSCKIPTION KATKS (Lneal Area) 2 Year Minimum Sulwrriptioii *7.
and a large crowd is expected. and $18 at the door. right at the fork onto Ashley. ment should be mailed by Dec. 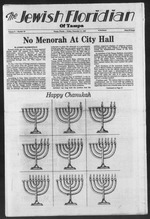 CONTACT: WATER WORKS WONDERS, INC.
WATER FROM YOUR OWN TAP"
Kefusonik.s \.v\ and Marina 1 nrmaii Leningrad, I'SSR This Chanukah, let us kindle the lights for Soviet Jews. Let us at the same time assist all Jews in need through our UJA/Federation Campaign. A strong Israel and a united Jewish community will help insure a bright Jewish future. i i i j ii i i r.
Prepared by the National United Jewish Appeal as a Jewish lifeline partnership service for American Jewish communities. Ring of 5 trees only $25Circle of 10 trees S50. framing will be sent to whomever you direct. *& v^ uour next party a real simcha! Waddings Bar/Bat Mltzvah Parties, etc. all the tumult in your kitchen! holiday celebration anique and unforgettable. ingredients and supervised by Rabbi H. David Rose of congregation Kol Ami. Glenn Phillips Chef de Cuisine 3911 W. Waters Ave.
want to sleep. I want to walk,"
like staying inside all the time. "Mainly, it's good for them,"
to study in Israel was established by the Jabotinsky Foundation. your holiday recipes for more flavor and nutrition. .............i___lumiuiiii' '..IV.V.V-. ''-.KW.W*-/' ''''' W.'. *.V.Wfi>J>J W.V.WM.WJ.WW&W '*' '' '.' .'-'t>?',"' . And that's just what's happening at the Preschool these days. sure to attend and join in the fun and festivities of the holiday. Lest we forget November .. .
We held our first open Parent Association Meeting ..
Preschool teachers had an evening workshop . ing experience for all ..
dian Reservation, and Alessi's Farmer's Market. .
available. Call for Chanukah paper, bows, etc... .
soup. Placemats, teepees, and centerpieces adorned the tables. Please note the following important Preschool schedule. Main Branch Only. Please sign up. Chanukah. Enjoy the Preschool vacation with your children. 1. Enhance the natural motor skills of the young child. 2. Develop increased flexibility, coordination and strength. Check the schedule for Toddler Gym with Debbie. * We will be closed Dec. 25 and Jan. 1.
day for members, $45 a day for non-members. held the second Monday, Dec.
the world will be auctioned off. the opening of our basketball. must be made by Dec. 14. Danny Salin has been a member of the JCC since 1969.
down at the end of the day. field trips in the area. needs it, and he works very hard to support the Center. RESERVATIONS MUST BE MADE BY FRIDAY, DECEMBER 11, 1987.
the Centre Club in Tampa. all your special floral needs. Edward I. Case Plumbing Co.
(at large, District 3); Alice K.
from 1 until 3 p.m.
treme neutrality in such areas. II M M -^ -**! 19 at Congregation Kol Ami. Zielonka, and Mr. and Mrs.
Green, all of Charlotte, NC. Morgan St. and Moon Ave.). $3, Children under 12 $2. and happiness to the patients. part of the festive evening. Center starting at 3 p.m.
bag, dreidel and treasure hunt. will be served at 6 p.m.
for children under three years. Janet Van Boven at 961-8955.
led by Mrs. Lynn Reiber. services on Friday, Dec. 11.
the First Lady of Israel. at New York hotels and more! need to be broken in. if we gave it away. $2,500 for a free NOW Account with no minimum balance. December 24 and get a $25 Gift Cheque for free. If you're 55 or older, you're good as gold at Florida National. your free $25 Gift Cheque once you do. 44 woun/eeA- In ^lo^ltt lo betote mou>.